Today for the To Ride A Puca release tour celebration I'm over at author Dawn Ius's blog. I hope you'll stop by to say hi and get a few extra entries into the contest. 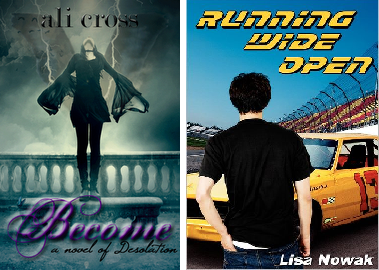 This week I’m giving away an eBook of BECOME by Ali Cross, a twist on a Norse tale that will leave you breathless, andRUNNING WIDE OPEN by Lisa Nowak, an adrenalin pumping ride with a hot tempered teen who loves car racing. The contest will be open until May 27th, the winner to be announced on the 28th. To Ride A Puca is available in eBook and hardback at B&N, Amazon, The Book Depository and other retail sites. So happy to see how wonderful your tour is going! GEEZ, I feel so aweful not being there for you this time. This house design I am doing is taking up every free second of my time. I am THRILLED that your blog tour seems to be going so well. I will try and drop by a few. Good luck Heather... I finished the Centaur illustration today. STUNNING. I can't wait to send it to you. Expect something in email by Sunday or Monday. Don't feel bad at all Michael, I completely understand! Yay! I'm looking forward to seeing the illustration!!! I think this is your best tour yet! I'm so happy it's going great for you! The Puca Tour has begun!